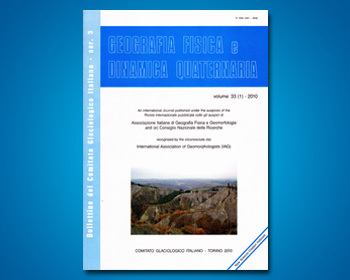 PICCARRETA M., CAPOLONGO D., BENTIVENGA M. & PENNETTA L.
This paper deals with the analysis of the role of the rainfall on the development of badlands in a semi-arid area of eastern Basilicata, locat – ed between the middle valley of the Basento river and the middle-lower valley of the Sinni river. The badlands develop principally on Plio-Pleistocene silty and marly clays, so it is possible to eliminate the lithology as study parameter. Some parameters such as erosivity, mean recurrence of precipitation events of different magnitudes, mean dry and wet spell lenghts, maximum number of dry and wet consecutive days have been calculated relatively to the period 1951-2000. The results show that rainfall plays an important role on soil erosion. In the whole study area the frequency and the length of dry periods tend to increase whereas the number of the consecutive wet days tends to decrease. In particular, anyway, it results that the pluviometric regime works differently in the Northern and Southern sub-areas. In the former, incised by the Basento river, erosivity and mean frequency of extreme events decidedly decrease ; in the latter, including the Cavone , Agri and Sinni rivers, erosivity and extreme events with> 30 mm magnitude increase. As a conse – quence pseudokarst and mass-movements are widespread in the South – ern area, while rilling and gullying control the badland evolution in the Northern area.